With the appearance of methods for the sequencing of genomes and less expensive next generation sequencing methods, we face rapid advancements of the -omics technologies and plant biology studies: reverse and forward genetics, functional genomics, transcriptomics, proteomics, metabolomics, the movement at distance of effectors and structural biology. From plant genomics to plant biotechnology reviews the recent advancements in the post-genomic era, discussing how different varieties respond to abiotic and biotic stresses, understanding the epigenetic control and epigenetic memory, the roles of non-coding RNAs, applicative uses of RNA silencing and RNA interference in plant physiology and in experimental transgenics and plants modified to specific aims. In the forthcoming years these advancements will support the production of plant varieties better suited to resist biotic and abiotic stresses, for food and non-food applications. 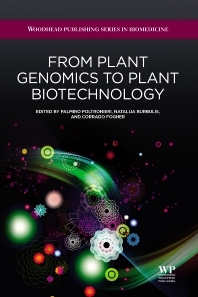 This book covers these issues, showing how such technologies are influencing the plant field in sectors such as the selection of plant varieties and plant breeding, selection of optimum agronomic traits, stress-resistant varieties, improvement of plant fitness, improving crop yield, and non-food applications in the knowledge based bio-economy. Dr Palmiro Poltronieri is researcher at the Agrofood Department of the Italian National Research Council. He is co-founder of Biotecgen SME - a service company involved in European projects, such as RIBOREG, NANOMYC, ABSTRESS, and TOMGEM. He has also tutored researchers for another start up, Bioesplora, in the EU project TRANS-BIO. He is Associate Editor to BMC Research Notes and is editor-in-chief for Challenges, an MDPI journal. He holds a Ph.D. in Molecular and Cellular Biology from Verona University. His current interest is on abiotic stress response in roots of tolerant and sensitive chickpea varieties, on activation of the jasmonic acid synthesis, and in the biotic stress response in model plants. Dr Natalija Burbulisis currently head of the agrobiotechnology laboratory and professor at the Crop Science and Animal Husbandry Department of the Aleksandr Stulginskis University (Lithuania). She holds a Ph.D. in Agricultural science obtained from the Lithuanian University of Agriculture, and for 10 years performed research in plant biotechnology, physiology and biochemistry. Current studies are in vitro selection of oilseed crops (rapeseed and linseed) - genotypes with important agronomic traits, including disease resistance, cold tolerance and oil quality improvements. Professor Corrado Fogher, Ph.D., is Associate professor of genetics and responsible for the transgenic plants sector at the Observatory on Transgenic Organisms in Agriculture at the Catholic University, Piacenza, Italy. He was NATO Fellow (1982-83) at the Department of Biochemistry, University of Missouri, Columbia, Researcher (1984-85) at the Department of Cellular Physiology and Molecular Genetics of the Pasteur Institute, Paris, and Visiting scientist at The Scripps Research Institute, La Jolla, California. He is Author or co-author of more than 70 peer-reviewed papers and Research Director of three SMEs, Plantechno, Incura and SunChem.